Blackmagic Design today announced the Blackmagic eGPU, a high performance graphics processor for pro creative software such as DaVinci Resolve, 3D games and VR. It is released with the new MacBook Pros also being announced today. The Blackmagic eGPU was designed in collaboration with Apple, it features a built-in Radeon Pro 580, two Thunderbolt 3 ports, HDMI 2.0, 85W of charging power and four USB 3.1 connections. It comes in an integrated design that first to support Thunderbolt 3 displays. The Blackmagic eGPU is shipping now for US$699 on Apple.com and in select Apple Retail stores worldwide. With the huge shift from Desktop units to Powerbooks, and no word yet on the new Apple Pro machines beyond the high end professional iMacs, this is a great option for many artists, especially freelancers or smaller studios. It is designed to address the needs of professional video editors, colorists and visual effects artists who need to remain mobile, but want the power of a desktop class GPU added to their MacBook Pro. 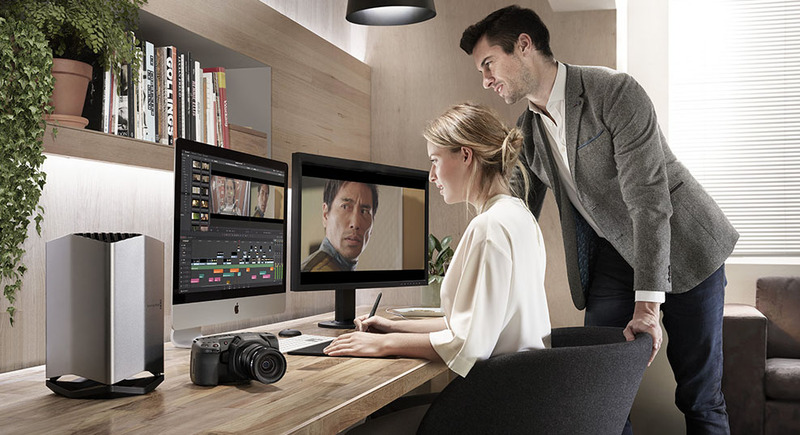 The Blackmagic eGPU simply plugs in via Thunderbolt 3, and then users can get improved graphics performance and acceleration of computational tasks. It’s perfect for speeding up professional creative applications such as DaVinci Resolve. 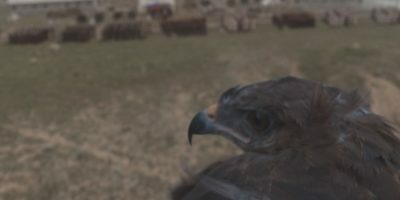 It means artists can get higher resolution images, higher frame rate gameplay, better lighting and more detailed textures, even on a laptop computer. Here at fxguide we rely on the Powerbooks for most day to day work and the top of the line iMac for AR-VR and Real time graphics work (more on this next week). While the iMac Pro is our go to machine given its impressive 18 cores. There is no getting around the fact that desktop machines stay in the office. This new MacBook Pro and eGPU will no doubt be popular with artists on location, on set or freelancing. The Blackmagic eGPU is extruded from a single piece of aluminum and features a unique thermal cooling system that’s been designed to balance the airflow and dissipate heat more efficiently. The cooling system also enables extremely quiet operation as low as 18dB, vital for those working in video production or in on-set environments. The Blackmagic eGPU features a Radeon Pro 580 graphics processor. You get 8GB of GDDR5 RAM, 256-bit memory bandwidth and 36 discreet compute units for up to 5.5 teraflops of processing power. The Blackmagic eGPU supports Metal graphics technology from Apple, which provides near-direct access to the GPU for maximizing graphics and compute performance with games and applications. BlackMagic explain that customers running DaVinci Resolve 15 can expect increased performance for editing with more real time effects, color corrections with more nodes and ResolveFX such as film grain, light rays, blurs and more. DaVinci Resolve 15 also fully supports multiple GPUs, as well as Metal, so it will get the full benefit of the Blackmagic eGPU. Customers can download DaVinci Resolve 15 now free of charge from the Blackmagic Design website. While no one believes this guy can operate a Mac... this shot gives the relative size of the eGPU , but we would see it being used most with a MacBook Pro and not an iMac seen here. In addition to graphics and computational acceleration, the Blackmagic eGPU is also a docking hub for connecting devices such as keyboards, mice, Thunderbolt monitors, big screen HDMI televisions, high speed storage and more. It features two 40Gb/s Thunderbolt 3 connections, a built-in 4 port USB hub and HDMI which supports 4K output. Plus, the connections are ergonomically spaced, making it easy to connect and disconnect peripherals. When it comes to power, the Blackmagic eGPU has a built-in power supply that powers the GPU while also providing 85W of downstream power via Thunderbolt 3 for charging laptop computers and powering peripherals. The power supply works from 100V to 240V so it can be used anywhere in the world. It is great to see Blackmagic Design working so closely with Apple and producing robust hardware for professionals. Resolve is a major force in all levels of colour grading. For example, DaVinci Resolve Studio was used to grade a lot of blockbusters this summer including Jurassic World: Fallen Kingdom and Solo: A Star Wars Story; indie hits such as RBG and Sorry to Bother You and more. For example Deadpool 2 was colored by EFILM Senior Colorist Skip Kimball using DaVinci Resolve, (although not with this new hardware).